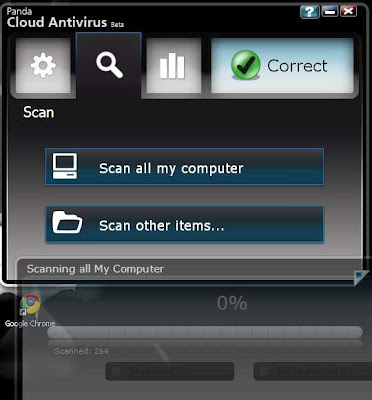 Panda Security announced the first global release of Panda Cloud Antivirus. If you've heard of cloud computing, then it's an addition to that evolution where all computing processes are utilized and executed remotely. We're in the verge of cloud computing. 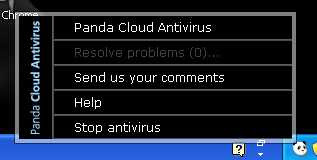 Panda Security claims they've set a landmark by offering first Cloud based Antivirus to the public. Unlike traditional approach, where it is must to keep definition files up-2-date and enable certain features like heuristic scanning ON all the time, Panda Cloud Antivirus needs none of them. Thus, a computer will be constantly protected from any infection. The only requirement is to use their proprietary cloud computing technology called Collective Intelligence to detect viruses,malwares,rootkits etc. This collective Intelligence puts you into their scanning list where their server is constantly monitoring your computer activities though their client called Panda Cloud Antivirus for any suspicious activities. Panda Security claims it'll very efficient and low on CPU/Memory Usage. Right now, the cloud antivirus is in Beta and once the beta expires it'll send the Serial Key to it's email subscribers for free. As they say and always, whenever a new software is launched, it's marketed as free and after a year or two, they start charging. I can see the same story repeating here. Whatever, for now it looks very convincing and when there are antivirus disabling viruses/malwares/etc around, you should give it a try. I gave it a try. It was a quick install(couldn't co-exist with other antivirus software, had to uninstall the other antivirus) and popped up in the taskbar. Scanning started. Even if it claimed 'it takes 6 minutes' to do everything, it took little longer than that. ok finally there is anti virus that doesn't need to be updated time and again...............good to hear that..